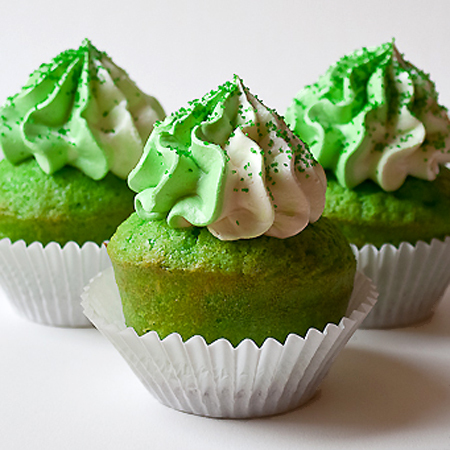 You are here: Home » Matcha Cupcakes! It was my mom who first introduced me to matcha — Japanese green tea. She’s always been a tea fan, and suddenly she was special ordering bags of matcha, and even bought a special bowl and brush-like spoon to mix it with. She made it for me once when she came to visit, and while I really like it, I don’t have the patience to go through all the trouble she does to drink it. MOCAFE’s Matcha Green Tea Frappe really makes the “matcha experience” come alive for me much easier now! Add milk and ice annnnnnd….done! But since matcha isn’t my go-to drink like chai is, I decided to see where else I could incorporate the tea into my life. While planning my son’s first birthday party, I figured it out. Matcha cupcakes! I skimmed a few established recipes and I have to say, I’m super inclined to make my own now. To make, start with any white cake/vanilla cupcake recipe. Follow the recipe as written, but add to it 2 tablespoons of Matcha Green Tea Frappe mix. Top with a simple buttercream frosting and for a little something extra, garnish with strawberries — a delicious paring with green tea! I’m not sure how the flavor combo will go over with a one-year old who currently thinks bananas are the best thing going, but I’m definitely going to make these for myself in the next few weeks. I love matcha! I have matcha green tea mints from Trader Joe’s and they rock. Adorable cupcakes, too! Well thank you :-). If you send us your address we will get some samples out to you. Thank you! Let us know how it turns out :-).